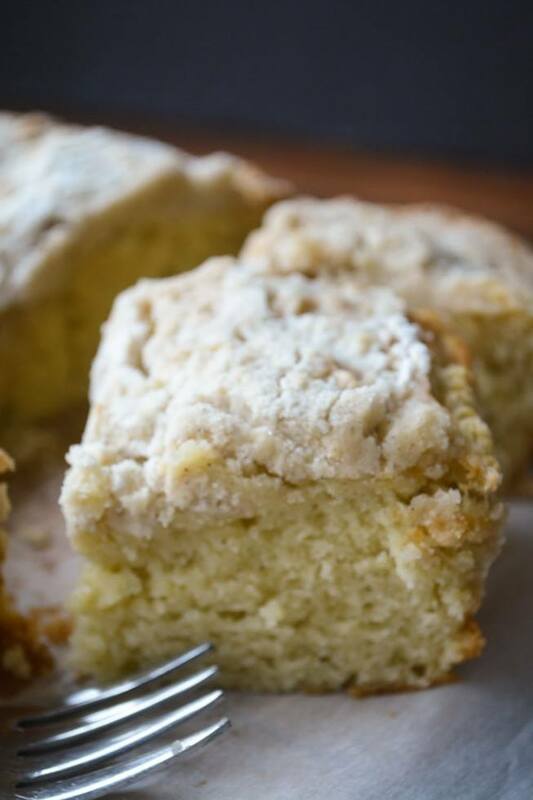 Cardamom Crumb Cake ~ this moist and pillowy New York style crumb cake recipe takes coffeecake to a whole new level with the subtle warmth of cardamom. Spray a 9x9 square baking pan and line with parchment paper if you want to be able to lift it out for cutting. That part is optional. Put the flour, sugar, baking powder, salt and cardamom in the bowl of a food processor and pulse to combine, You can also do this by hand in a large mixing bowl. Cut the butter in small pieces and add it to the bowl. Pulse to combine, maybe about 20 pulses. The mixture should be crumbly with the butter well distributed and in very small pieces.. You can also do this by hand with a pastry cutter. Measure out 1 cup of the mixture and set aside. Whisk together the wet ingredients and mix with the dry, just until combined. Spread the batter into the pan, and top with the reserved crumbs. Bake for 40-45 minutes, until a toothpick comes out clean.